Across the U.S. Department of Energy's (DOE) Argonne National Laboratory, teams are tackling different scientific problems associated with additive manufacturing, often referred to as 3-D printing, so as to advance our understanding of the process that could revolutionize manufacturing. At Argonne's Advanced Photon Source (APS), a DOE Office of Science User Facility, a team led by APS physicist Tao Sun and Missouri University of Science and Technology professor Lianyi Chen recently completed a study that identifies possible ways to reduce powder "spattering," which can result in defects in the finished product. This information could help businesses across industries, from aerospace to defense, medical instruments to automotive. 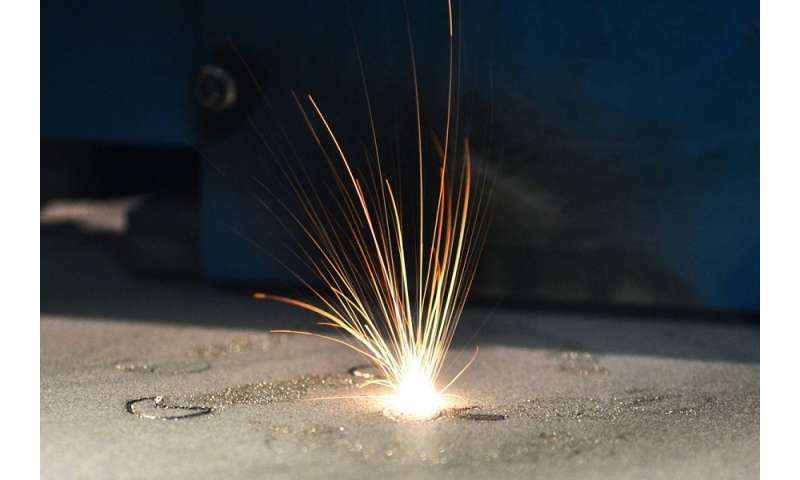 In additive manufacturing, manufacturers use lasers to heat metallic, plastic and ceramic powders. These heated powders are then spread in very thin layers, one layer at a time, into a build plate—resulting in custom finished products, made on-demand. This process is called "laser powder bed fusion," or LPBF. Developers have used this technology to create components for airplanes, automobiles and even medical implants such as artificial jawbones. Engineers are using titanium and other metal alloys to improve production efficiency, lower product costs and simplify supply chains. There is no limit to the possible uses, depending only on the vision of designers. Yet this process remains flawed. The intense lasers hitting powders frequently cause the powders to spatter, spray or splash, resulting in defects in products or quality control issues. In addition, this can create other problems when engineers seek to reuse leftover powder, as the splashed powder tends to contaminate the rest. Engineers must often repair finished pieces, or revise and repeat the printing process. The phenomenon is difficult to measure with conventional tools. Neither can it be well predicted by modeling or simulation, and so the detailed dynamics of powder spattering are not yet fully understood. By using the extremely bright X-rays at the APS, the team was able to observe the dynamics of this powder movement, measuring the speed and acceleration of the powder. From these experiments, the team created a diagram illustrating the dynamics and provided possible ways to reduce spattering. By capturing 50,000 frames per second, the researchers were able to probe and quantify the dynamics of powder movement as a function of time, environmental pressure and location under the wide range of temperatures—from 80 to more than 4,940 degrees Fahrenheit—that occur in LPBF. The team also observed the driving force of motion caused by the heated metal's vapor plume and the resulting flow of argon gas. "We're trying to understand the magnitude of the powder ejection," Sun said. "Our work is providing clues on how to mitigate it. In the end, in trying to get better products, we need modeling. Those models rely on experimental data to validate them. Using X-ray technologies we can visualize the process and validate the model. Nobody has developed accurate models to predict the powder motions yet because the process is so complex and can't be measured directly." The research team identified three ways to potentially mitigate powder spatter: presintering—heating to prepare to compact the powders via temperature or pressure—at a relatively lower temperature, before beginning the main sintering (compacting or forming) process; reducing the thickness of the powder bed; and adjusting pressure on the powder bed to balance hot spatter (which increases under more pressure) and total spatter (which decreases under more pressure). The team found evidence that spatter-induced pores caused defects in a sample built with a thicker layer of powder, while such defects were rarely found in a sample with a thinner layer. Researchers relied on physics-based theories to identify sintering and adjusting pressure as potential mitigation tools. The team used the contrast mechanism in X-ray imaging to capture the trajectories of all flying powder in one video, despite extreme temperature variation. With thermal and visible light imaging, scientists must use different filters and exposure times to see particles with dramatically different temperatures. "For the first time we can quantitatively study the transient dynamics of powder melting and spattering behavior with high spatial and temporal resolution for all powders at the same time, including hot, cold and hidden powders," said Chen, who is a co-corresponding author with Sun of the article "Transient dynamics of powder spattering in laser powder bed fusion additive manufacturing process revealed by in-situ high-speed high-energy X-ray imaging," published in Acta Materialia on March 26. "This study is useful to the 3-D printing community to overcome a major barrier to making parts with fewer defects," said Chen. The aerospace and defense industries are especially interested in the findings because of the complicated parts they need. "The aerospace and defense industries use 3-D printing to fabricate tooling, lightweight structures and functional components with complex geometries," said Wes Everhart, a co-author of the paper, from DOE's Kansas City National Security Campus. "The automotive industry is just getting started using it to fabricate complex components." "This is important because it's providing clues on how to mitigate the spatter," Chen said. "Nobody has developed reliable models yet because additive manufacturing is so complex and can't be measured directly. This gets us closer to realizing the full potential of 3-D printing."